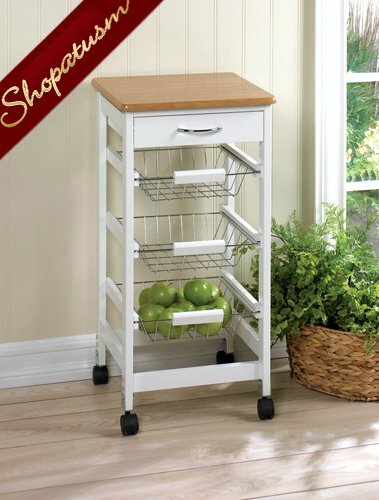 This is the perfect kitchen trolley, featuring three slide-out storage baskets that are perfect for cookbooks, utensils, or fresh produce! The white framework is set on four sturdy wheels and topped with a wooden surface, and also includes a useful pullout drawer. Item weight: 14.6 lbs. 14 3/4 inch x 14 3/4 inch x 30 inch high. Bamboo, MDF wood, and metal. Contents not included. Some Assembly Required.